Yes, I am still here, albeit in a slightly different part of Sheffield. Thanks to young Andy Halfie I made the final move from the flat on Thursday and have been busily unpacking ever since. The house isn't finished yet, but I have a fully operational kitchen, bedroom and study, with the bathroom not far behind. Just got the computer set up today (although apparently EE can't even think about transferring the broadband for a fortnight, so I'm reliant on Jim's mifi) and back to work tomorrow. Hopefully back into the swing of blogging too. I have been looking at light fittings a lot recently, and something that first struck me as odd when low energy bulbs first came on the market now seems to have developed into full blown lunacy, and it makes me very cross. Back in the good old days of incandescent bulbs, lampshades and light fittings were rated at 40, 60 or 100 watts, depending on how heatproof/flammable they were. This is because those old fashioned bulbs, as well as producing light, also produced a lot of heat. That's why they were so energy-inefficient. Energy saving bulbs, from the twists of fluorescent tube to the latest LEDs, save energy by producing more light for less wattage, and in turn considerably less heat. An 11 watt energy saving bulb supposedly gives as much light as a 60 watt incandescent bulb, and much less heat. And LEDs produce hardly any heat at all. So why oh why oh why do lampshades now say things like 'Max. 60 watt incandescent/11 watt fluorescent/5 (or whatever) watt LED'? Surely the whole limit thing was always about the heat the bulb produced - which was indeed a safety concern - but they've created these equivalancies as it if was the light that was potentially dangerous. The upshot of all this of course is that the recommendations on the lampshades are meaningless and there is no proper or useful guidance on what wattage of low energy bulbs is actually suitable or even safe. So, in short, why oh why oh why? I cooked the first meal in the new house today, and what a delight it was to be cooking with gas again. With turnips in the veg box again I decided to make a lentil shepherds pie with a turnip topping. Never having done this before, I had no idea how it would turn out. The last lot of turnips went into a turnip and lentil stew, which was ok... but any further ideas about what to do with turnips (no, not that Baldrick) would be most welcome. They still feel to me like the sort of thing only slightly desperate people would eat. The flat that I shall shortly be leaving is one of six, in a large Victorian house that has been in the same family since the 1940s. A few years ago, in the basement, I came across a mahogany cabinet, with a mirrored back and glass fronted sides and doors. It was in poor condition, but I fell in love with it (I do love a bevelled mirror, especially if it's surrounded by mahohogany). So I asked the landlord if I could have it in my (nominally furnished) flat. He readily agreed, and I believe it had belonged to his mother. So I gave it a good clean and recovered the shelves, which were dressed with faded and worn green velvet, and set it up in my living room, to display my nice glass and small collection of curiosities (and not so curious things - and not the rivet collection, that's different). A souvenir of Vienna, brought home by my parents in the early 1960s. This lived in their cabinet when I was a child, and was one of the things I was allowed to get out only when ill. I was fascinated by it. It may well have been on the same trip that they bought Wolfgang the polar bear in Salzberg. Handling him was another rare and treasured priviledge. This was my father's lighter, which lived on the table next to his chair (my mother likewise had a table by her chair, but a pocket rather than a table lighter). He smoked Woodbines, heavily; she Players No 6. He started smoking in the army, when he was told, on being promoted, that he should grow a moustache and take up smoking in order to look sufficiently mature for his new rank. Finally something else which tickled my fancy as a child - and as a rare treat I was permitted to use this glass, which was also my father's. I don't know what drink it's intended to measure, but it has gradations up the side which are labelled in increasing order of size: Ladies, Gentlemen, then a small pig, and finally a large pig at the top. Fortunately these treasures will not be rendered homeless when I laeve the flat, as I have done a deal with my lovely landlord to buy the cabinet, so it will shortly grace the front parlour of my new house. This morning's task was sorting out the pile of paperwork that has been accumulating while I've been preoccupied with the house, filing it, and dealing with numerous changes of address. Then I moseyed over to the house and met Jim and Ricky taking a stroll in the park. Jim asked me, did you measure the height before you ordered that new toilet? Jim: Did you measure it with the top on the cistern? Me: Yes... why, is it fouling the window sill? I've started packing up at the flat and as of yesterday it was in a state of chaos - packed bags of clothes, boxed of books and collapsed empty cardboard boxes everywhere - when I got a text from the letting agents saying was it OK for them to come and take some new pictures of it today. I said yes - as long as it was the afternoon - and spent the morning giving the place a long overdue tidy and a superficial clean (I can't be bothered doing that properly until I do the final big clean now). I must say I do feel much better with it tidy again, but it was achieved by the simple expedient of shoving everything into the tiny utility room. Which meant that I couldn't get to the washing machine. Never mind, there is a spanking new shiny washing machine freshly installed in the house, and one thing I have really missed these past five years is hanging washing on a proper outside line. I'd also found a hank of washing line (bought years ago to repair the garden chair, aka the crap (sic) bed, but that's another story), so once young Will from the agency had done his snapping I loaded up my rucksack with a load of washing, the line, a tub of Persil and a bag of pegs, and set off for the house. First I had to work out all the potential settings on the machine, so that I could decide on the one which will be the only one I ever use (not quite true, I do do woollies specially), and they were a trifle too electronic for my taste. Having decided that, I loaded it up, switched it on... and nothing happened. It is plumbed in, isn't it, I mused? But if it is, where is the hiss and rush of water? We'd both assumed that the plumber had plumbed it in along with completing the rest of the kitchen plumbing, but quickly realised that this was based on a rather flimsy foundation - i.e. that he'd pushed it back into place. So Jim discovered that it is possible, just, to pull out and manoeuvre behind the machine in the very narrow corridor of kitchen, confirmed that it had not in fact been plumbed in, and rectified the situation. So then off it went. We were sitting out in the garden enjoying a cup of tea when it first started to empty, and watched the suds well up through and overflow the drain and run along the side of the kitchen... ok, we thought, there's yet another possible cause of the damp, and Jim put his drain rods on the list of things to bring up from Sussex. He tried sticking his arm down (try stopping him) but couldn't reach anything. Nonetheless, the machine finished its cycle with a very satisfactory 1600 spin, and I did get to hang the washing on the line - probably just in time for a thunderstorm. A workmate came to see the house today, and brought me a lavender plant. Which I have planted at the top of the steps, opposite the rosemary bush. I kno0w this is rather dull, and I'm sorry I'm not boating - but if nothing else, this will be a record for me to look back on. The kitchen is coming along very nicely - in fact, the tiling is the last major job outstanding, and then there will be the shelves to fit. This is what it looked like this afternoon. I have a new oven, hob and washing machine, but the firdge and freezer are from my mother's. The units are from Travis Perkins' Benchmarx range, and the worktops and sink from Worktop Express in Chesterfield. The worktops are iroko, which I really liked on Warrior. It feels very grown up having solid wood worktops. I'll try to remember to fcus in on some details tomorrow. Meanwhile, back at the flat, I am sorting and packing. Yesterday it was clothes - and I have already transferred all my hanging clothes to the house's built in wardrobes. Today I did books and have filled five of my smaller boxes - but that's without my canal books collection. I do tend to be quite unsentimental about books, and it's a very rare novel I'll keep once having read it. I've got quite a big pile to be divided between Oxfam and the Alvecote book swap, and a couple of bags of clothes went to Oxfam yesterday, so I'm taking the opportunity for a bit of a clear out as I pack. Tomorrow... paperwork. Plus I need to go and pay for the bedroom carpet - once that's fitted, that will be the first room finished (apart from picture rail), and buy some tiles for the bathroom. Possibly a new piece of vinyl for the floor too - a design rethink means getting rid of a fitted cupboard, meaning the original piece won't be big enough for the new floor area. It's an exciting development though, all inspired by a fortuitous find at Braunston. I'm back in the West Midlands but for once I'm not boating. I've spent the last two days at a conference at the University of Warwick, which as most people know, is not in Warwick, nor really anywhere in the immediate vicinity. It's not really in Coventry either, but rather on the outskirts of Kenilworth. I guess Universities didn't have to worry about what the Competition and Markets Authority checking to see whether they were mis-selling themselves back in the sixties. I have to say though that they laid on the best conference I think the Foundation Year Network (for that is us) have ever had - and we rose to the occasion it's some really good papers and presentations. It's always good too to catch up with other people from across the country who are labouring away in that much overlooked and oft misunderstood corner of HE. It was quite exhausting though as well. Then tomorrow - this is exciting - I've been invited to act as the external 'expert' on the panel validating a new Foundation Year at a university in Birmingham. I've been booked into a lovely hotel, where I've just had a lovely dinner in a lovely old fashioned hotel restaurant, and they're sending a taxi for me in the morning. I must be careful not to let it go to my head. When I get back to Sheffield I've got two weeks off work which will be consumed by extensive house-work. I've found a photo of Bakewell's kitchen. I reckon it's almost exactly the same width as my new one, although not quite as long. Bakewell was a brilliant boat - and still is, last I saw, now a well loved home for Paul and Mandy at Wheaton Aston. 21 inches in diameter, and getting in the way ever since I bought it in Oxfam about nine months ago. Jim is digging around under the bedroom floor to attach a hook to the joist for it, before the carpet goes in. In other news, The Yorkshire Tile Company did not disappoint, and I have ordered my tiles for the kitchen. They continue the quasi-industrial, quasi-Victorian vibe which will be augmented with some seventies artefacts (not least my dish draining rack, which is a story in its own right). I've been getting tiling ideas for the bathroom too, which is a bit worrying, as I had thought I'd be content with the boring white trade tiles - which can, it transpires, be matched. But I've always been a complete sucker for tiles. It's a small galley style kitchen, what they call here 'offshot', and as such rather desirable, apparently. It's an extension to the original house, with a mono pitched roof. A further extension beyond the kitchen houses a lobby with the back door, and beyond that, the downstairs toilet. The kitchen is ten feet long and 6'3 wide - dimensions I have some experience of (although I can't find a photo of Bakewell's kitchen right now with which to illustrate it). The somewhat overbearing presence of the boiler has been removed to the downstairs loo, and I have gone for fewer, less mega-tall wall cupboards - the remainder of the wall space will be open shelves. I've got a gas hob (again for the first time since Bakewell), and a white china sink with integral drainer, when they send the right one on Tuesday. Tomorrow we are off to Sheffield's largest tile emporium to see if I can improve in any way upon the tiles I fell in love with a few weeks ago in a little local shop. Gorgeous, but small (and thus apparently harder to lay successfully on a less than perfectly even surface) and rather expensive, and £60 a metre. Jim is hoping I will choose something larger... I'm wondering if I might find something cheaper. We also need to try to match the bathroom tiles - super-boring 8x10 slightly undulating white, no doubt the ubiquitous trade tile a decade ago but Jim hasn't had any success so far. I feel a water feature coming on. When Body Shop stopped selling their Sandalwood perfume oil (why??? oh why???) many years ago, I shopped around for a replacement and settled on Lush's Karma range. I'd buy the eau de cologne and the 'bubble bars', which render the water a satisfyingly hippyish purple, and one sitting on a saucer in the bottom of the wardrobe, waiting its turn to be dissolved, made excellent pot pourri. There was always a hitch though - the spectacularly over-attentive staff in the shop. You can never just browse in there - not only does someone immediately leap out to assist you, they want to have a chat as well. I found it a very oppressive experience. So I took to ordering online - where I could get a bigger, better value bottle of perfume too. The trouble with that is that you have to compile a password worthy of Fort Knox, just to buy some smellies. Last time - when I was about to spend £83 (!!) - it appeared I'd forgotten it. I couldn't check out without logging in, of course, and by the time I'd set a new one, I'd been locked out for too many unsuccessful attempts with the old one (they didn't bother telling me that before I set the new one). It may not seem much, but it was enough to bring me to my senses - eighty plus quid on some smelly water and a few lumps of epsom salts and purple dye - and to end my relationship with Lush (yes, I know they're kind to animals, but they're pretty precious about that too). So I'm now looking round for a new smell - or hopefully an old one; I'll be going back to sandalwood if I can find a nice one. I keep meaning to blog about the house but I keep forgetting to take pictures. Between Facebook and CanalWorld, there probably aren't many of you who haven't already seen these fabulous pictures taken on the GU by a French photographer in 1944 - but if nothing else, it'll save me losing the link. We like to keep cooking simple on Chertsey, but also reasonably nutritious. I like to stock up before we leave so that we don't have to find shops - or stop to use them - en route. When we do, it's a bit of a bonus. Not having a fridge, paradoxically, makes this simpler. Also, we can decide on an impulse to go to the pub without worrying about those pork chops we really meant to cook tonight. The Origo is a brilliant stove, but I don't want to be boiling pasta or rice (or even potatoes) with the concomitant condensation. So what I stock up on before leaving is tins of pulses (butter beans, kidney beans, chick peas, borlotti beans, haricot beans, lentils, cannelini beans, etc. ); jars of cooking sauces - Loyd Grosman are favourite (this is the least healthy part), and sachets of that pre-cooked 'microwave' rice. I also take whatever vegetables I have lying around the house (and sometimes some tinned veg too). Then every evening, I start with whatever veg needs using up, pick a sauce and a pulse to complement it, stick it all in a pan and put it on a low heat til the veg is cooked (I tend not to use things like carrots, that need a lot of cooking, much - but mushrooms, cabbage (don't knock chickpea and cabbage korma until you've tried it! ), tomatoes, all sorts of greens, peppers (I fry them a bit first), courgettes, fresh beans all work well.) Sometimes I'll add extra ingredients like olives, or maybe tuna. Then when it's cooked, I'll pick a suitable sachet of rice and empty it onto the top for the last couple of minutes. The resultant meal may end up sprinkled with grated cheese. It's possible to achieve quite a lot of variety in this way, and the only fresh food we ever need to buy is the vegetables - and at a pinch, they can be left out (at risk of scurvy, of course). I do miss having fresh milk in my tea, but putting up with soya milk seems a small price to pay for not having to worry about where the next pint's coming from. Talking of which, the serving suggestion for all the abovementioned recipes always includes a bottle of beer. I have never really got to grips with spreadsheets. It seemed to me that they got used - at work - all too often when a simple table would have served instead. Over the past few years I've used them more and more, and learned how to do simple things with them, on a strictly need-to-know basis. A few months ago, however, I realised that these new found (and hard won) skills could be pressed into the service of boating - and greated the Great Chertsey Victualling Spreadsheet. 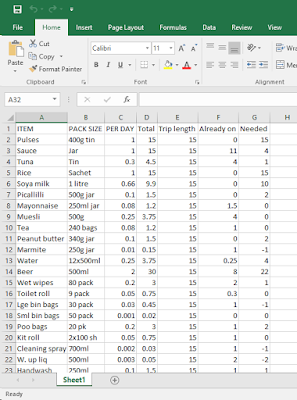 Basically, I input the number of days we're going away for, and the inventory of what's already on board, and it creates a shopping list.up to the nearest whole number - rounding down is no use when I need to know how many packs to buy. Is this truly impossible in Excel? 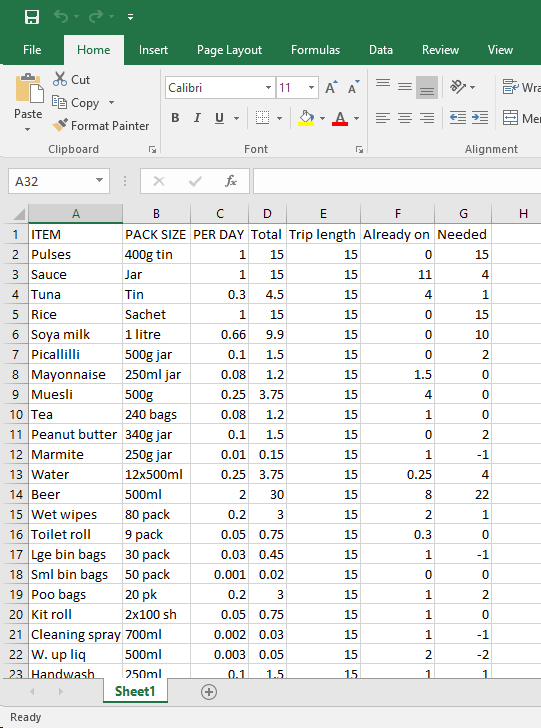 I started with estimates of how much we use of each item daily, which can be adjusted with more experience. Meals can be planned in this way because of the cunning way we eat whilst boating - which I will spin out into another post. I had a lovely piling chain once. It came with Andante. It was stainless, and the rings were welded onto the chain, not attached with shackles. We managed to leave it behind on the Trent and Mersey, and I was quite upset at the time. Easier again. The only way it might fall a little short is that I found it (on the basis of one attempt) that it wasn't quite so easy to pull the rope back through. It might also bother some people that it can easily be undone without untying the rope - an occasional concern, I suppose (although I've found that when people want to untie you, they usually manage to do just that - and it isn't an immediately obvious thing to do), but also, possibly, an advantage (as I nearly had to put to the test when Jim disappeared before untying the rope from the fore end t-stud, which I can often barely reach). And a great deal more secure than a nappy pin. I've just totted up that over the past two and a bit weeks, we've driven 810 miles in order to enjoy the weekend at Braunston - and it would have been further if Jim hadn't been starting from Sheffield. That's for what is basically - Sheffield-Braunston - a ninety mile journey. First we brought two cars to Braunston, then returned in one of them to Alvecote* (Braunston-Alvecote = 45 miles). Then we brought the boat to Braunston, and took the car back to Sheffield. The following weekend we drove from Sheffield for the Braunston weekend, then back on Sunday. Then on Friday, back to Braunston, fetch the boat back to Alvecote, pick up the car there, drive to Braunston, then take both cars back to Sheffield. We probably won't be back on the boat now until the end of August, when the plan is to visit the Ashby at last, before returning for the Alvecote Bank Holiday do - house permitting! *Not counting going back for Jim's wallet. Very few, it turns out, what with the house, and a bit of boating. Unconvincing dystopian future in which children are at a premium and parents have annoying nicknames. Hill's lightweight offering, PI Joe Sixsmith. Inoffensive, slightly more interesting than not reading at all.